You decide. I am posting some family photos, because I do not have any project photos. Well, there is this. 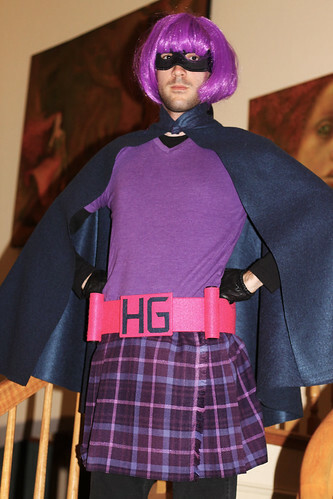 At the last minute my son asked for help making him a “Hit Girl” costume for a Halloween party last night. He likes to shock and amuse his friends. He always choses something a bit inappropriate, such as being a 12 year old girl with 5 o’clock shadow. Last year he was “Juno”. Well, anyway, I only had Friday to sew, and the first few hours I spent cleaning up my sewing area to have a place to work. The skirt is made with stash fabric. I had 4 yards and the skirt took only a 1/2 yard. There is plenty left for the jacket I have planned. I sewed the fabric into a tube by topstitching the fringe end over the other end, then eyeballed 4 pleats on each side. The pleats held nicely with just pressing. I put in an elastic waste, cutting out the excess pleated fabric in the front. It took less than an hour. I was amazed it looked so cute. The cape and belt are sale felt from JoAnn’s. One yard for the cape, 1/4 yard for the belt. Both of those went together quickly too. The cape is a half circle. The two cylinder things on the belt are handles from my Leslie Sansone’s walk-belt that I do not use. I use the belt, but took the handles off because I get more resistance holding the tubes. Finally I cut the hair. I was nervous about cutting the wig. I cut with a down angle and the hair just curled under like that. I don’t have much experience working with hair, because I do not have much of my own as the next photo will show. Rick and I went to Disneyland for my birthday. I love Disneyland. 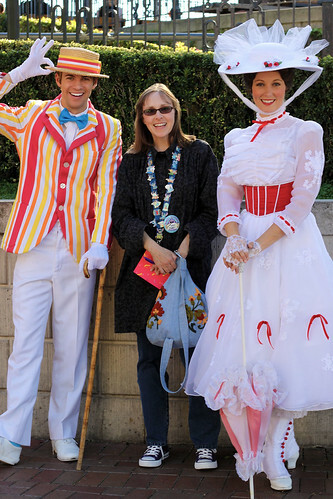 I took our son’s old autograph book and had fun meeting the character’s so I could see the costumes up close. This is the best photo of me. With the sun in back my wrinkles aren’t as noticeable. LOL. I am wearing my converse tennies. I love these shoes. My knees didn’t bother me at all. As you can see my jean bag is holding up nicely. It is my regular bag. I have a funny story about my “Stitch” pin collection. When I met the green army man from “Toy Story”, he asked me if I earned my medals. I told him “I am a seamstress, so yes, I earned every “Stitch”.” He thought that was funny. I collect “Stitch” things since his name is “Stitch”. My Halloween shirt is made from the Folkwear Pattern for the Croatian Shirt. I have made this shirt a few times. I love big smock shirts. The only change to the pattern that I made was adding 2 inverted patch pockets with welt openings to the front. I like having pockets on the front instead of in the side seams. Next time I am going to adjust the front shoulder pleating to be more flattering over the bust, but in black it doesn’t really show. Here is a photo of my hubby of 26 years. 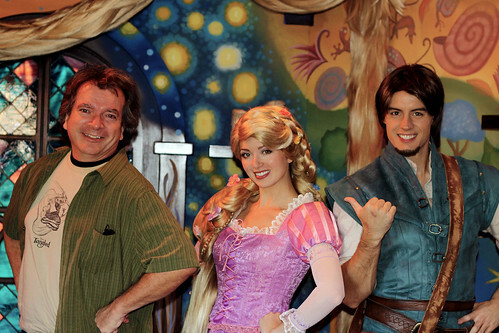 He is excited about the new Disney movie, “Tangled”, coming out this holiday season. He worked on the layout, or in other words, did camera work for the film. I can’t wait to see it. I want to see it in 3D. Since I am so out of the habit of blogging, it takes a bit of effort to sit myself down in front of the computer. I need to work on that. This past month flew by. November here we come, ready or not. This entry was posted on Sunday, October 31st, 2010 at 4:17 pm and is filed under Life. Tagged: Life. You can feed this entry. You can leave a response, or trackback from your own site. Your sons outfit it so cute! How did it go over with his friends? I’m sure he had a blast. It was a quiet Halloween here. I went to stitch and have dinner with a friend and got home a bit late. I was able to hand out candy for a while. The costumes weren’t that good this year here. Nothing really original.